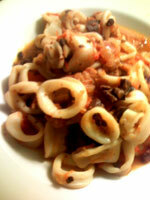 Squid is one of my favorite foods. However, I try to order it for takeout in my hood and it is always sub par. I ordered this once from the Italian takeout joint around the corner and it was so lack luster that I had to make it better myself. Heat the bacon in a large skillet on medium high eat. Sautee until its crispy and golden brown. Drain off most of the fat and add the onions and garlic. Keep stirring and cooking until the onions are translucent and soft. Add the tomatoes, seasoning and salt and pepper. Cook for about 5 minutes until the tomatoes turn into a sauce. 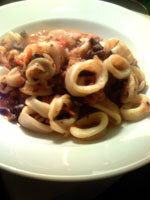 Add the squid and olives and keep cooking, for about 5 minutes, until the squid looks done. Squeeze the lemon over the squid and serve.